Bernard Herrmann was born, Bernard Rentsch at Hamilton in 1892 to Caroline Rentsch of Tabor. The following year, Caroline married Wilhelm Herrmann, and Bernard or Ben as he was known, took the Herrmann surname. The family lived at Hochkirch, a German community just east of Hamilton. Wilhelm Herrmann passed away in 1906. 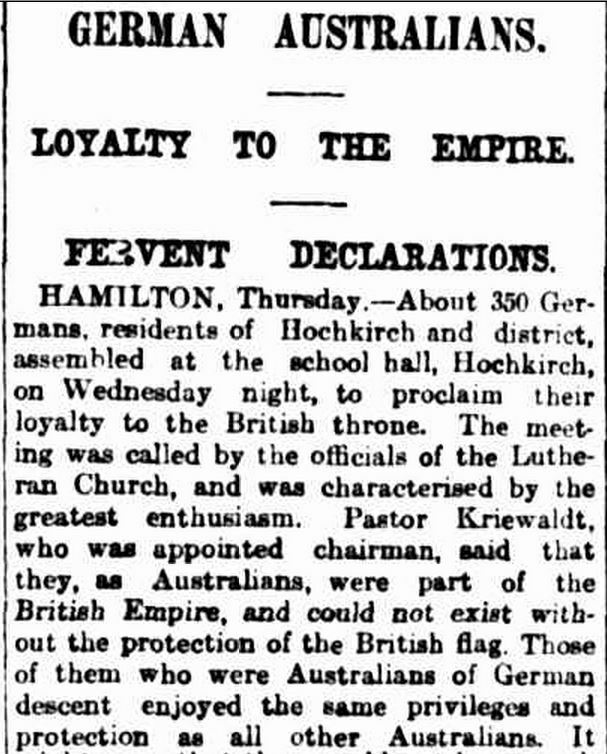 When Britain declared war on Germany on 4 August 1914, in the Hamilton district attention turned to the residents of German descent at Hochkirch and other nearby German communities such as Tabor and Warrayure. 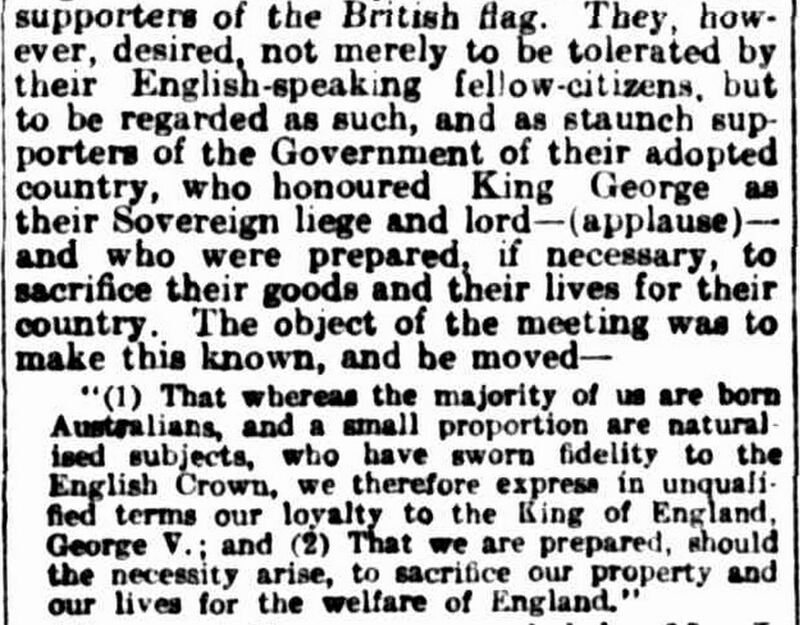 Their loyalty to the British Empire was under question, and while there had been some unrest leading up to the events of 4 August, the declaration brought new pressures. So much so, town meetings were called in those communities as residents felt impelled to express their loyalty, despite many of them having been born in the local district. The following article, published in The Argus of 7 August 1914, describes one such meeting at Hochkirch on 5 August 1914, the day after England declared war on Germany. “THIRD EDITION.” The Argus (Melbourne, Vic. : 1848 – 1957) 7 Aug 1914: <http://nla.gov.au/nla.news-article10800917&gt;. There was no doubting where second generation Australian Ben Herrmann’s loyalties were and he was among the first enlistments from Hamilton. On Friday 21 August, the people of Hamilton farewelled a group of around twenty-five men with a street parade. Ben Herrmann was there, marching shoulder to shoulder with his fellow countrymen. The following day, Ben enlisted at Broadmeadows and on 19 October, he departed Australia with the 4th Light Horse Regiment, arriving in Egypt on 10 December 1914. The 4th Light Horse went to Gallipoli in May 1915 as reinforcements. On 3 August, Ben fell sick from dysentery and evacuated from Gallipoli, spending time in hospital at Gezira Island, Cairo and Alexandria. He rejoined his regiment in Gallipoli in October and remained there until their evacuation on 11 December. Once back in Egypt, the 4th Light Horse was split up, with two squadrons forming the 2nd Anzac Corps Mounted Regiment. They sailed for France in March 1916. Once in France, the regiment took part in traffic management, prisoner escorts and at times reconnaissance. On 21 August Ben received gun shot wounds in the back and transferred to the 1st Australian Casualty Clearing Station at Estaires. Bernard Herrmann died of his wounds at the clearing station on 26 August 1916. The name of the Hochkirch Post Office was removed in 1918, and given the suitably British name of Tarrington, taken from the local property of the late Stephen George Henty. The Dundas Shire Council had submitted the name of Birdwood to the Post Master General, but it was knocked back because of an existing Birdwood in N.S.W., so Tarrington was submitted. 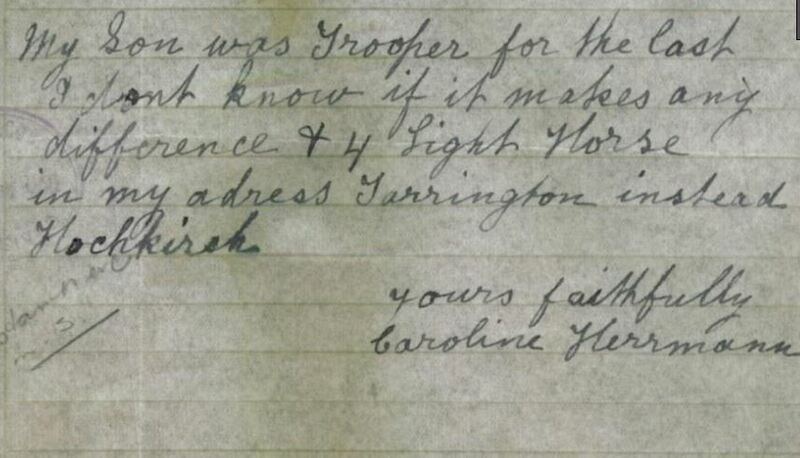 In a letter to the Defence Department in 1921, advising she had received and duly paid for photos of Ben’s grave and a memorial scroll, Caroline Herrmann acknowledged the name change that remains in place today.